In the last PATH Intl. eNews, it was stated that Sandy Webster, the PATH Intl. James Brady Lifetime Achievement Award recipient, was with Giant Steps in California. Sandy is not currently with Giant Steps and has her own consulting company, Gaits of Change. We apologize for the confusion. Please consider PATH Intl. 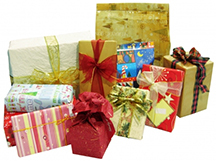 in your end-of-year giving, whether by check, stock or online. If you have any questions about donating to PATH Intl., please email Megan or call (303) 452-1212, ext. 107. Thank you! PATH Intl. honors the memory of the 20 children and the six adults killed at Sandy Hook Elementary School in Newtown, Conn. Our thoughts are with the families and the community as well as the 18 PATH Intl. centers that serve the state of Connecticut. If you've already made your list and are checking it twice, it doesn't even matter if you've been naughty or nice! Because for everybody, all items in the PATH Intl. 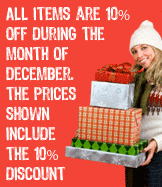 Pro Shop have been discounted by 10% for the month of December! All items can be custom embroidered with the PATH Intl. logo of your choice - Certified Instructor, PATH International Equine Services for Heroes, Premier Accredited Center, etc., and in most case your name! The prices shown online reflects the discounted amount. While orders can no longer be guaranteed for Christmas delivery, the discount still applies. Happy shopping! Congratulations to PATH Intl. Board of Trustees member Arlene Alen, who was voted to fill a seat on the Dewey-Humboldt, Arizona, council earlier in December. The appointment will run for six months. Click here to read the full story. If you need a quick last-minute gift for the holidays, consider giving a donation in honor of a loved one. The PATH Intl. In Memory webpage is dedicated to honor and memorialize special people and horses. A $50 donation allows the donor to post up to 50 words and an image of the honoree; $25 is for a words-only post. If you donate by noon MST on Friday, December 21, PATH Intl. guarantees your post will be up by Christmas day. Questions? Contact Megan at (303) 452-1212, ext. 107. PATH Intl. and the American Paint Horse Foundation (APHF) have forged an innovative partnership designed to benefit those who wish to further their education and will provide scholarship assistance to potential instructors of therapeutic riding beginning January 1 2013. While open to anyone with skills in equine management, horsemanship, instruction, teaching methods, and disabilities, preference for scholarships will be awarded to medical professionals. Click here for applications for the scholarship. Applications should be postmarked by March 1, 2013, and scholarship recipients will be notified by April 1, 2013. In recent talks to reduce the federal deficit and avert the year-end "fiscal cliff," top White House aides are pressing nonprofit groups to line up behind the president's plan to raise income tax rates for upper-end taxpayers and to limit the charitable deduction for high-income earners by placing a cap on total itemized deductions. This could impact charities that often depend on the contributions of wealthy donors to keep their doors open and services available, and damage their ability to fund-raise. Read the Washington Post article here. You can lobby your government representatives to protect the charitable giving incentive and oppose any proposal to reduce or cap the tax value of charitable contributions. Click here to download a sample of a letter you can tailor for you or your center's use and mail or email it to your government representatives. Click here to find your representatives. PATH Intl. welcomes these centers that joined PATH Intl. in November 2012. If you want information on center membership, contact Karen Province. PATH Intl. CEO Kay Marsh Green was recently interviewed and mentioned in an article in Stable Management.com. "The Horse as Healer" by Lisa Derby Oden discusses some of the qualities necessary to run a successful equine-assisted activities and therapies program and gives an overview of how PATH Intl. has grown. Click here to read the article. The Center for Therapeutic Riding of the East End, a PATH Intl. Premier Accredited Center in Bridgehampton, NY, and CTREE's Mosely were featured in an interview with Kelly Killoren Bensimon in the November issue of Equestrian Magazine, the publication of the United States Equestrian Federation, about Kelly's experiences as an equestrian. Click here to read the story. Our favorite quote from Kelly came when she was asked if she had any advice for first-time riders. "The only advice I can give is to beware," she said, "for the sport is so wonderful and ever-changing that all you will want to do is ride." Mindy Young, a senior at Texas A&M University majoring in Agricultural Leadership and Development, is conducting a survey of companies and organizations within the equine industry to better understand what they are looking for when hiring a college graduate. PATH Intl. 's participation is significantly valued. Click here to take the survey. It should take no longer than 15 minutes. Please use identification number 1011.